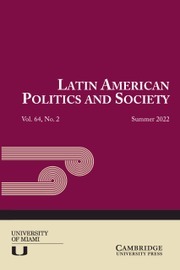 Latin American Politics and Society publishes the highest-quality original social science scholarship on Latin America. The Editorial Board, comprising leading U.S., Latin American, and European scholars, is dedicated to challenging prevailing orthodoxies and promoting innovative theoretical and methodological perspectives on the states, societies, economies, and international relations of the Americas in a globalizing world. In addition to its traditional research articles, Latin American Politics and Society includes Critical Debates—review essays that survey major themes in recent Latin American studies literature. The Policy Issues section presents contending perspectives on major issues of significant policy relevance, and Research Notes is an outlet for shorter pieces with questions of data, theory, and method. The Book Review section provides critiques individual books.